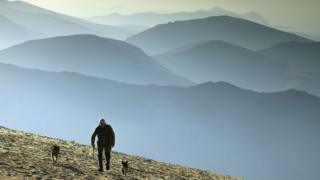 A draft report on the future of the Welsh national parks has been criticised by conservationists. The Alliance for National Parks Cymru, which includes a number of conservation bodies, said it risks diminishing their international standing. The Future Landscapes Wales (FLW) report has been produced by a group under the chairmanship of Lord Elis-Thomas, who refused to comment. The Welsh Government said discussions were ongoing on the final report. The RSPB and Welsh Wildlife Trusts (WWT) said they could not support the report in its current form. Both bodies said there was much to support in the document, but added "we must convey how disappointed we are by the report". The FLW working group was set up by the Welsh Government in 2015. The RSPB and WWT said the report contained no clear proposals, and displayed a lack of acknowledgement on the urgent need to address the loss of biodiversity within protected landscapes. The report - which was due to be published a fortnight ago but will now be unveiled at a later date - was seen by BBC Wales' Newyddion 9. It states that "its desire is to unlock the full potential of all landscapes in Wales" and national parks and areas of outstanding natural beauty have a pivotal role to play in the future prosperity of the country. It calls on more collaboration to create employment opportunities and says "communities need to be inspired to develop their own vision and long-term goals for the future to generate employment and create opportunities for young people to stay in and return to their communities". But conservationists said they were concerned the report makes no mention of the "Sandford Principle" which states the main statutory purpose of national parks is to conserve and enhance the natural beauty, wildlife and cultural heritage of the area. A Welsh Government spokesman said: "It is important to remember this is a draft version of the report. "The Future Landscapes Wales Programme has been highly collaborative in nature and has involved a wide range of partners, who have contributed to the discussions and the drafting. "These discussions are ongoing as a final report is prepared for publication before the summer recess."